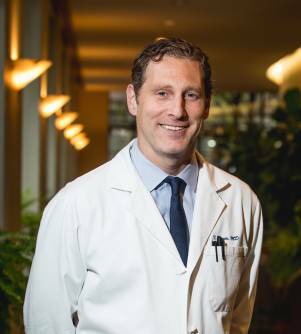 Dr. Timothy Deyer is a board certified Musculoskeletal and Interventional Radiologist specializing in diagnostic musculoskeletal MRI and ultrasound and ultrasound guided procedures including musculoskeletal steroid and platelet rich plasma injections and soft tissue and bone biopsies. He has been a clinical instructor at New York Hospital and Clinical Instructor in Radiology at Weill Cornell Medical College, Cornell University since 2010. Dr. Timothy Deyer has written and co-authored numerous peer reviewed articles in several professional journals and several book chapters. He completed fellowships in interventional radiology at St. Luke’s-Roosevelt Medical Center and in Musculoskeletal Radiology at the Hospital for Special Surgery. He was a radiology resident at the Mount Sinai Medical Center, where he was Chief Resident in his final year. Dr. Timothy Deyer received his M.D. from the University of Michigan where he graduated in the top five of his class and was elected to the medical honor society Alpha Omega Alpha. He also completed an M.S.E. in Biomedical Engineering and B.S.E. in Mechanical Engineering at the University of Michigan. Lesions of the Talus -An MRI Analysis. Accepted for publication 8/2017. American Journal of Sports Medicine. Post-Operative Cyst Formation Does Not Appear to Affect Clinical Outcomes After Autologous Osteochondral Transplantation of the Talus: An MRI Evaluation. Accepted for publication to Arthroscopy: The Journal of Arthroscopic and Related Surgery. Gianakos AL, Hannon CP, Ross KA, Newman H, Egan CJ, Deyer TW, Kennedy JG. Anterolateral tibial osteotomy for accessing osteochondral lesions of the talus in autologous osteochondral transplantation: functional and T2 MRI analysis. Foot Ankle Int. 2015 May;36(5):531-8. Ross KA, Hannon CP, Deyer TW, Smyth NA, Hogan M, Do HT, Kennedy JG. Functional and MRI outcomes after arthroscopic microfracture for treatment of osteochondral lesions of the distal tibial plafond. J Bone Joint Surg Am. 2014 Oct 15;96(20):1708-15. Haleem AM, Ross KA, Smyth NA, Duke GL, Deyer TW, Kennedy JG. Double-Plug Autologous Osteochondral Transplantation Shows Equal Functional Outcomes Compared With Single-Plug Procedures in Lesions of the Talar Dome: A Minimum 5-Year Clinical Follow-up. Am J Sports Med June 19, 2014. Ross KA, Hannon CP, Deyer TW, Smyth NA, Hogan M, DO HT, Kennedy JG. Functional and MRI Outcomes After Arthroscopic Microfracture for Treatment of Osteochondral Lesions of the Distal Tibial Plafond. J Bone Joint Surg Am, 2014 Oct 15;96(20):1708-1715. Hannon CP, Smyth NA, Murawski CD, Savage-Elliot I, Deyer TW, Calder JDF, Kennedy JG. Osteochondral Lesions of the Talus: Aspects of Current Management. Bone Joint J 2014;96-B:164–71. Hannon CP, Ross KA, Murawski CD, Deyer T, Smyth NA, Do H, Kennedy JG. Functional and T2 Mapping Outcomes after Arthroscopic Microfracture with Concentrated Bone Marrow Aspirate for Osteochondral Lesions of the Talus. International Cartilage Repair Society Biennial Meeting 2013. Izmir, Turkey. September 15-18, 2013. Poster Presentation. “Functional, T2 Mapping, and MOCART Outcomes after Arthroscopic Microfracture with Concentrated Bone Marrow Aspirate for Osteochondral Lesions of the Talus”. Hannon CP, Ross KA, Murawski CD, Deyer T, Smyth NA, Do H, Kennedy JG. American Orthopaedic Foot & Ankle Society Annual Meeting 2013. Hollywood, Florida. July 20, 2013. Podium Presentation. “Imaging of Pedal Osteomyelitis” Deyer, TW. New York State Podiatric Medical Association Clinical Conference. 2012. New York, NY. Lamb J, Murawski CD, Deyer TW, Kennedy JG. Chevron-type medial malleolar osteotomy: a functional, radiographic and quantitative T2-mapping MRI analysis. Knee Surg Sports Traumatol Arthrosc. 2012 May 16. Murawski, CD, Duke GL, Deyer TW, Kennedy JG. Bone Marrow Aspirate Concentrate (BMAC) as a Biological Adjunct to the Surgical Treatment of Osteochondral Lesions of the Talus. Techniques in Foot & Ankle Surgery. 10(1):18-27, March 2011. Williams B, Ellis S, Deyer T, Pavlov H, Deland J. Reconstruction of the Spring Ligament Using a Peroneus Longus Autograft Tendon Transfer. Foot and Ankle International. 2010. 31(7): 567-577. Guller J, Samman M, Deyer TW, Lookstein R, Nowakowski, S. Repair of a splenic artery aneurysm using a novel balloon expandable covered stent. Journal of Vascular Medicine. 2006. 11(2):111-3. “PACS Image Export to MIRC: Integrating the Process into the Standard Reading Session—A One Click Platform Independent Software Solution” RSNA 92nd Scientific Assembly and Annual Meeting, 2006. Chicago, IL. Deyer TW, Ashton-Miller JA, Van Baren PM, Pearlman MD. Myometrial contractile strain at uteroplacental separation during parturition. American Journal of Obstetrics and Gynecology. 2000. 183: 156-159. Deyer TW, Ashton-Miller JA. Unipedal balance in healthy adults: effect of visual environments yielding decreased lateral velocity feedback. Archives of Physical Medicine and Rehabilitation. 1999. 80:1072-1077. “Environments that provide diminished visual velocity feedback adversely affect unipedal balance in healthy adults.” Deyer TW, Ashton-Miller JA. Creativity and aging: exploring human potential. The gerontological society of America. 11/1997. Cincinnati OH.